^ "Conflict Observer Project | Central African Republic: Roots of the Conflict and Actors". Cscubb.ro. 29 October 2014. Retrieved 18 March 2018. ^ "Central African Republic president, PM resign at summit: statement". Reuters. 10 January 2014. Retrieved 10 January 2014. ^ Ibrahim, Alkhali; Abdraman, Hassan (20 August 2012). "RCA: Protocole d'accord militaro-politique contre le régime de Bozizié". CPJP-Centrafrique (Press release). Retrieved 31 March 2013. ^ "New clashes in CAR as presidential vote looms". Al Jazeera. Retrieved 30 January 2014. ^ Braun, Emmanuel (24 January 2014). "Former minister killed as Central African Republic clashes escalate". Reuters. Retrieved 6 February 2014. ^ "US calls on CAR to end cycle of violence". Al Jazeera. Retrieved 6 February 2014. ^ "UN chief warns CAR could break up". Al Jazeera. Retrieved 21 February 2014. ^ "Ethnic cleansing of CAR's Muslims alleged". Al Jazeera. Retrieved 21 February 2014. ^ "Politics blamed for CAR divisions". Al Jazeera. Retrieved 21 February 2014. 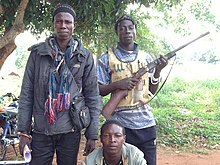 ^ "Muslims in CAR wary of French presence". Al Jazeera. Retrieved 21 February 2014. ^ "France sends new troops as CAR strife deepens". Al Jazeera. Retrieved 21 February 2014. ^ "UN chief urges rapid reinforcements for CAR". Al Jazeera. Retrieved 21 February 2014. ^ "Deep divisions as CAR violence continues". Al Jazeera. 20 January 2014. Retrieved 6 February 2014. ^ Marin, Paul (6 October 2013). "Fourteen killed in clashes in Central African Republic". Reuters. Retrieved 2 January 2014. ^ "30 killed in clashes in Central Africa Republic". Indian Express. 8 October 2013. Retrieved 2 January 2014. ^ Marin, Paul (9 October 2013). "Around 60 dead in clashes in Central African Republic". Reuters. Retrieved 2 January 2014. ^ Location Settings (12 October 2013). "Central Africa violence kills six". News24. Retrieved 2 January 2014. ^ Location Settings (13 December 2013). "More than 600 killed in CAR this week". News24. Retrieved 2 January 2014.